With the first three instalments in Capitals Outsider’s ‘Getting To Know You’ series being based around active members of the Capitals roster, it is time to turn our attention to one of the organization’s most promising young goaltender prospects. Currently recording some impressive statistics, especially in recent games with the Hershey Bears, 21-year-old Russian goaltender Ilya Samsonov is on the right path to success, following Braden Holtby and Pheonix Copley on the Caps’ depth chart. Hailing from the industrial city of Magnitogorsk (translating to ‘city of the magnetic mountain’), situated in Oblast, Russia, Samsonov has proved impressive from an early age, debuting in the KHL in 2014 in a relief game for Metallurg Magnitogorsk before spending his first season with the club’s junior equivalent Stalnye Lisy Magnitogorsk, recording a .918 save percentage across 18 games. The same year, he followed up his impressive start by representing Russia’s U18 squad before slotting back into the KHL on the official roster for Metallurg Magnitogorsk in 2015. In the 2015 NHL Entry Draft, Samsonov was ranked as the top European goalie that year and was the first goaltender selected in the first round at 22nd overall by the Washington Capitals. Proving his worth, Samsonov spent from 2015-2018 close to home with the KHL’s Metallurg Magnitogorsk, averaging a save percentage of .929. He would also appear on the world stage, representing his homeland of Russia four times and at two World Junior Championships. He won Silver in 2016 in Finland and Bronze in 2017 in Canada with the national squad. In 2016 he was named to the World Junior Championship All Star Team. Samsonov’s hard work and impressive form in the KHL saw him sign a three year entry-level contract with the Capitals and assigned to the Hershey Bears of the AHL. Since joining the Bears, Samsonov has been working hard to prove himself ready for the NHL level. Throughout 20 games in Season 2018/19, he has recorded a GAA of 3.38 and a SVS% of .871. 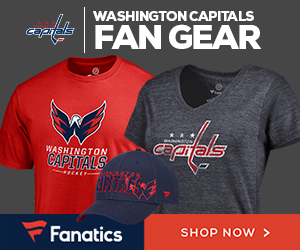 Recently, Samsonov recorded his first AHL shutout in a 3-0 victory over the Lehigh Valley Phantoms and in November 2018, dressed as backup for Copley in the Capitals’ matchup against the Avalanche. Although yet to make his NHL debut, Samsonov is one to watch and is doing everything right in Hershey to ensure a debut will not be far away. The 'fight' is fading from the Caps play.